Considering the size of that in relation to the sun is unnerving. Yeah, I was gonna say it's probably the size of one of the gas giants. I'd say close to Neptune's size. How about a solar prominence? Those are huge. How about a solar prominence? 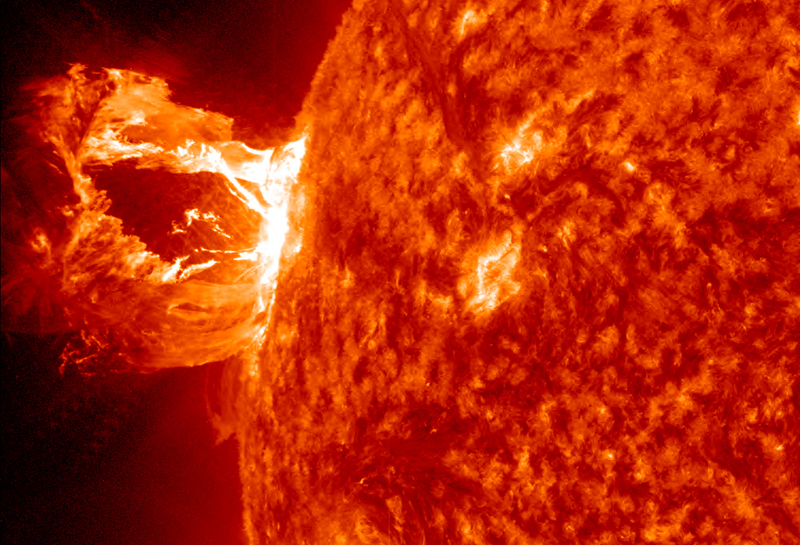 Those are [huge](http://www.nasa.gov/images/content/639303main_20120416-m1flare-orig_full.jpg). I'm always fascinated by the size of planets, stars. There can be a star that big, so the "tornado" would "swallow" our sun. I just can't concept how small is a human compared to these. It'd probably melt, tear, destroy everything you ever knew in a blink of an eye. Except a tornado is caused by differences in air pressure, this plasma jet is following twisting magnetic fields. Brah . . . . Solar Dynamics Observatory tells how it is! A small, but complex mass of plasma gyrated and spun about over the course of 40 hours above the surface of the Sun (Sept. 1-3, 2015). It was stretched and pulled back and forth by powerful magnetic forces but not ripped apart in this sequence. The temperature of the ionized iron particles observed in this extreme ultraviolet wavelength of light was about 2.8 million degrees C.
"Small" in relation to the Sun's actual size, that is. [Solar Dynamics Observatory](http://sdo.gsfc.nasa.gov/gallery/potw/item/657) tells how it is! >A small, but complex mass of plasma gyrated and spun about over the course of 40 hours above the surface of the Sun (Sept. 1-3, 2015). It was stretched and pulled back and forth by powerful magnetic forces but not ripped apart in this sequence. The temperature of the ionized iron particles observed in this extreme ultraviolet wavelength of light was about 2.8 million degrees C. "Small" in relation to the Sun's actual size, that is. It should be noted that a wavelength is not measured in degrees. They are saying the wavelength that the light is seen in is ultraviolet, that the ionized iron particles are 2.8 million degrees Celsius. As KillerMech said, there's an embedded clause ("observed in this extreme ultraviolet wavelength of light") inside "The temperature of the ionized iron particles ... was about 2.8 million degrees C". My god.. I thought this was some sort of sick joke. All these comments and everyone seems to see something I didn't see. I watched it like 4 times before I realized there was scroll bar on the side of the window. My god.. I thought this was some sort of sick joke. All these comments and everyone seems to see something I didn't see. I watched it like 4 times before I realized there was scroll bar on the side of the window. Damn. In the scientific community we call this a plasnado, it's similar to a tornado but more closely related to a sharknado. How big is that compared to the size of earth? Where is this ice sun and what would happen if it crashed into our fire Sun? if the ice and fire suns were to collide, our solar system would be engulfed in steam. it still wouldn't end the drought in California, though. Actually because E=mc^2 the sun would just burn hotter because you are adding mass to it. What was used to record this? As others have said the SDO was used to observe the phenomenon but I get the feeling that you wanted to know what software and source images were used. While I can't say for sure what was used in this case, you can use Helioviewer.org or their stand alone java based jHelioviewer to lookup create and record solar observation data. As others have said the [SDO](http://sdo.gsfc.nasa.gov/) was used to observe the phenomenon but I get the feeling that you wanted to know what software and source images were used. While I can't say for sure what was used in this case, you can use [Helioviewer.org](http://www.helioviewer.org/) or their stand alone java based [jHelioviewer](http://www.jhelioviewer.org/index.html) to lookup create and record solar observation data.